Click here to Book a Tour of our serviced offices! Here at 96 on Fourth, we believe in entrepreneurs, business owners, the professional expanding from a home office & the startup launching, like you, that’s who we are. 96 on Fourth is owned & developed by Bruce Jones a passionate & successful entrepreneur. He built 96 on Fourth for you and entrepreneurs just like you who need a professional & productive yet warm and friendly office space to run your business from in Sandton. So we offer more than serviced office space, we offer you the opportunity to be part of the 96 on Fourth family where internal networking creates business synergies and lasting friendships. 96 on Fourth is the perfect location for your office - close enough to Sandton CBD for convenient meetings and with quick access to Sandton Drive to miss most of the Sandton traffic. 96 on Fourth offers a prestigious, upmarket solution for furnished, serviced office space with an outdoor area for lunch / breaks. Professional furnished office solutions helping to create a productive working environment. Best Price: We will match* any written quotation for service offices in Sandton. * At 96 on Fourth, we offer a professional, serviced office solution to Business Owners. 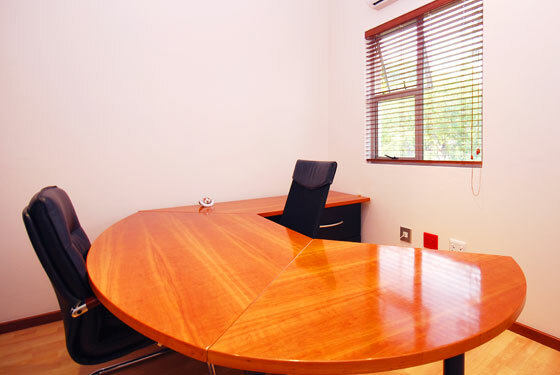 Our offering of furnished serviced office space, both from a facilities and costing perspective is very competitive. As such we are happy to match any written 'like-for-like' quotation for serviced offices for rent in Sandton. T’s & C’s apply.